Bracero Cocina de Raiz is in the last weeks of its final act before doors reopen as Romesco Mexiterranian Cocina on Tuesday, June 6. To celebrate its run in San Diego, Bracero is hosting a party on its final night - Saturday, June 3 - featuring giveaways and good times. The final night of Bracero is on Saturday, June 3. Save the date to come by and raise a glass to the Little Italy restaurant that stole our corazóns during its opening in 2015. Order a meal on the iconic “hand plate” that is oh-so Instagram worthy and its yours to take home (while supplies lasts). Bracero will also be giving away branded T-shirts and other memorabilia to diners throughout the night. Luis Pena, co-owner of Bracero, invites all down for its last hurrah and for an evening full of smiles, toasts, good food and fun. The venue will be a lively one before officially closing its doors - come say adios amigos! 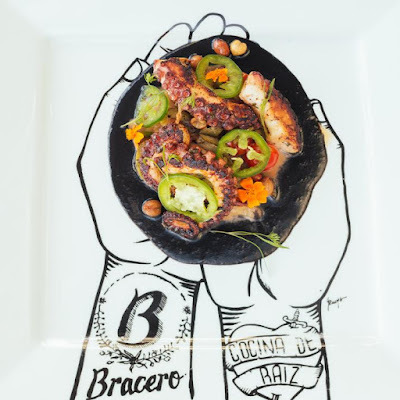 Bracero Cocina is located at 1490 Kettner Boulevard in San Diego's Little Italy. For more information, visit bracerococina.com.